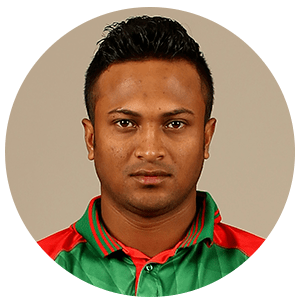 Shakib Al Hasan (born 24 March 1987) is a Bangladeshi international cricket player, former Test, ODI captain and current Twenty20 International captain, appointed in April 2017. He is well known for his aggressive batting, controlled bowling and athletic fielding. Considered as the greatest cricketer to have ever played for Bangladesh, Shakib is acknowledged as the best all-rounders in the world with highest rankings in all formats. In 2015, Shakib became the first and only cricketer in history to be ranked the No.1 all-rounder by ICC in its Player Rankings in all three formats of the game (Test, Twenty20 and One Day Internationals). After briefly losing the number one rank, he quickly earned the feat back and continues to be the only player sitting at the top in all three formats. On 13 January 2017, he registered the highest individual score (217) by a Bangladeshi batsman in Tests. On the last match of Group Stage of ICC Champions Trophy, 2017, Shakib along with Mahamadullah had a record ODI partnership stand of 224 from 209 balls. This is the best partnership record for any wicket for a Bangladeshi pair in ODIs and a second best in Champions Trophy. His extraordinary cricket commitments made him a national hero in Bangladesh and an ambassador of cricket worldwide. Born in Magura, Khulna, Shakib started playing cricket at an early age. He developed a left-handed batting style in the middle order combined with a slow left-arm orthodox bowling. He continued his endeavor by joining BKSP, the top sports academy in Bangladesh. In 2004, at the age of 17, he was drafted by Khulna to play in the National Domestic League. He first represented Bangladesh at the U-19 level. In August 2006, the 19 year old Shakib made his national team debut against Zimbabwe at Harare Sports Club. He played an important part in Bangladesh's victory, where he scored 30 runs and bowled out Elton Chigumbura to get his first ODI wicket. Shakib had been a regular performer since breaking into the national team and was rewarded with the captaincy in mid 2009. He took over from his compatriot and longtime leader Mashrafe Mortaza. Shakib went on to lead Bangladesh in the 2011 ICC Cricket World Cup, and remained the captain for a few home and away series'. He was relieved of his duties in late 2011 when his BKSP colleague Mushfiqur Rahim was named the new captain. Shakib holds numerous records in both domestic and international formats. As of 2016, he has played over 250 matches and scored more than 8000 runs including 9 centuries in ODI's, tests and T20 internationals, second most for a Bangladeshi cricketer. In July 2015, he got his 200th ODI wicket. With this achievement, Shakib became the seventh member of the elite club with at least 4,000 runs and 200 wickets. Currently he is the leading wicket taker for Bangladesh on ODI's. He is also one of only three players to score a century and take 10 wickets in the same Test match. His achievements on the pitch brought him numerous accolades, world and Asian XI call ups, Wisden recognition and established him as a national icon. On 28 August 2017, Shakib became only the fourth bowler in Test cricket to get a five-for against all other nine Test playing nations and, two days later, secured his second ten-wicket haul and second successive five-for to deliver Bangladesh's maiden test win over Australia. Shakib married Umme Ahmed Shishir, a Bangladeshi American in December 2012. 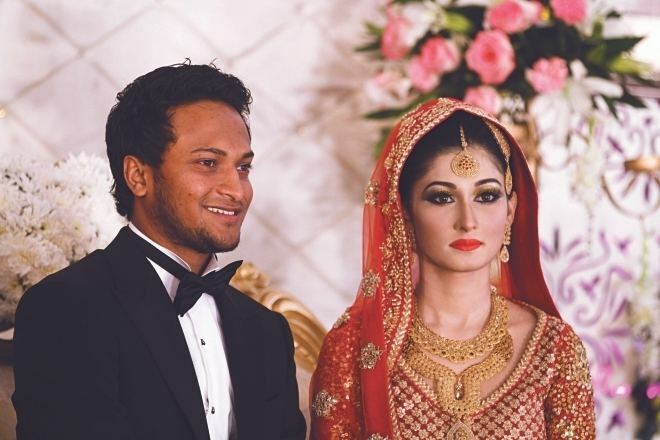 The couple met each other in 2011 while Shakib was playing county cricket for Worcestershire in England. They had their first daughter Alayna Hasan Aubrey in November 2015. In an interview to Cricinfo, Shakib said that he is a big fan of football and an avid supporter of Spanish club FC Barcelona, and expressed interest to watch them play rival Real Madrid at Camp Nou. He was a student of BKSP, Bangladesh Krira Shiksha Pratisthan. He is studying BBA (Bachelor of Business Administration) at American International University-Bangladesh (AIUB). 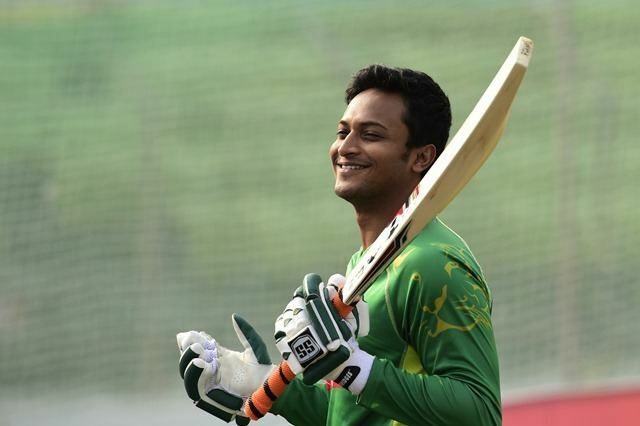 According to Prothom Alo sports editor Sadman Sabah Ali, Shakib "was fairly proficient at cricket and was often hired to play for different villages". In one of these matches Shakib impressed an umpire who arranged for him to practice with the Islampur Para Club, a team in the Magura Cricket League. During the practice session, Shakib batted aggressively and bowled fast, as he usually did, but also chose to experiment with spin bowling which proved to be not so effective. He was picked to play for Islampur and took a wicket with his first ball; it was his first delivery with a proper cricket ball, having previously generally played with a taped tennis ball. He spent six months training at Bangladesh Krira Shiksha Pratisthan, a government-run sports institute. In 2005, during the final of a tri-nation tournament involving England and Sri Lanka's Under-19 teams, Shakib scored an 86-ball century and took three wickets to lead his team to victory. Between 2005 and 2006, Shakib played 18 youth One Day Internationals; he scored 563 runs at an average of 35.18, and took 22 wickets at an average of 20.18. Domestically Shakib has represented Khulna Division since 2004, and in 2010 he spent several months playing for Worcestershire in England, becoming the first Bangladeshi player to represent an English county cricket team. For the 2011 Indian Premier League, Shakib was contracted by Kolkata Knight Riders. In the first season of Bangladesh Premier League, he captained Khulna Royal Bengals, and in the second season he led Dhaka Gladiators to the tournament title. He played for Rangpur Riders in the 2015 BPL season. 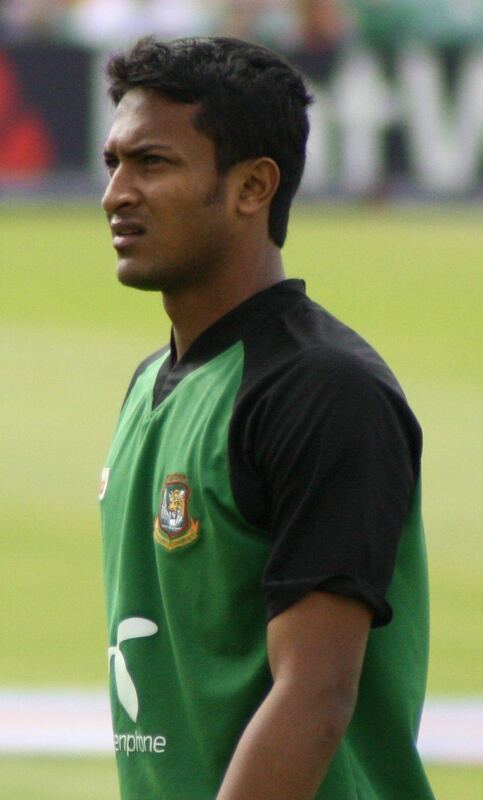 Shakib represented Uthura Rudras in the 2012 Sri Lanka Premier League. Shakib also played for Barbados Tridents in the 2013 Caribbean Premier League. He played for Adelaide Strikers in 2014 replacing the injured Johan Botha, thus becoming the first Bangladeshi to play in the Big Bash League. Shakib made his One Day International (ODI) debut against Zimbabwe on 6 August 2006, where he scored 30 runs and bowled out Elton Chigumbura to get his first ODI wicket. He made his Test debut the following 6 May against India. From January 2009 to April 2011 and again from March 2012, Shakib was ranked first amongst ODI all-rounders by the ICC. In December 2011, he became the world's top-ranked Test all-rounder. In December 2014 Shakib became the world's top ranked Twenty 20 all-rounder. He is currently the only all rounder to be ranked in the top 3 of ICC Player Rankings across every format of international cricket. In 2008, Shakib took at that time the best bowling figures by a Bangladesh player in Tests, 7 wickets for 36 runs, against New Zealand. To date he is Bangladesh's highest wicket taker in Test Matches. In the home series against West Indies in late 2012, he became the 2nd Bangladeshi to take 100 test wickets, making him the leading wicket-taker in tests for Bangladesh. He also achieved the feat of becoming the quickest all-rounder to take 100 wickets and score 1000 runs. He achieved the milestone in just 28 matches. However, he got ruled out of the ODI and T20 series due to a shin injury. 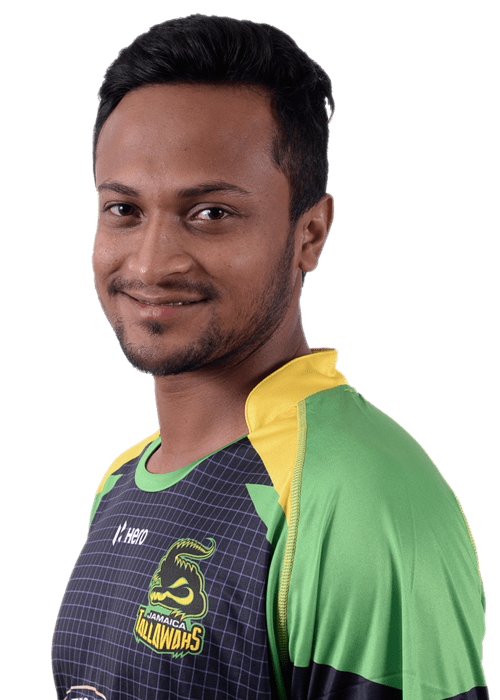 In the auction of the BPL 2, Shakib was brought by defending champions Dhaka Gladiators for $365,000, the most expensive player in the tournament. He led his team to victory, getting 329 runs and 15 wickets in 12 matches, emerging as the Man of the Tournament for consecutive second time in the BPL. In the 2013 Caribbean Premier League, Shakib played as an all rounder for Barbados Tridents. On 3 August 2013 against Trinidad & Tobago Red Steel Shakib recorded the second best bowling figure in T20 cricket dismissing six batsmen to finish with figures of 6 for 6 from his four overs at Kensington Oval. In the 2014 Indian Premier League, he was retained by Kolkata Knight Riders for a fee of INR 2.80 crore. In the competition he scored 227 runs in 11 innings at a strike rate of 149.34; his best being a 60 of 38 balls. He also achieved 11 wickets in 13 matches at an economy of 6.68 and an average of 30.36. His all-round performance was instrumental in Kolkata Knight Riders' title win. After the retirement of Mashrafe Mortaza in 2017, Al Hasan was appointed as the T20I captain of the team for the second time. He first captained the team in between 2009 and 2010 seasons, when he also held the captaincy in all three formats. However, Bangladesh lost all four T20Is when he previously captained. His first tour is against Pakistan in July. On 28 August 2017, Al Hasan became the 4th bowler in Test history to record a 5-wicket haul against all Test Playing nations (except Afghanistan and Ireland, who have only just granted Test status earlier that year.) when he grabbed 5 wickets against Australia in his first encounter with the team. He also scored a half-century in the first innings. In the second innings, he only scored 8 runs with the bat, but he grabbed another 5 wickets to secure his first 10-wicket haul and the win. On 7 July 2014, Shakib was banned for six months from all sorts of cricket for what the Bangladesh Cricket Board described as a "severe attitude problem". Shakib missed Bangladesh's tour of the West Indies; he was also prohibited to participate in foreign tournaments until 31 December 2015. Controversy arose when Shakib left to play for the Barbados Tridents of the Caribbean Premier League, allegedly without informing board officials and without obtaining a No Objection Certificate from the board, a claim he has denied. Shakib found himself embroiled in further controversy after a dispute with coach Chandika Hathurusingha led to rumours of him threatening to retire from Test and One Day cricket. The BCB has ended the restriction on no-objection certificates being issued to Bangladesh all-rounder Shakib Al Hasan, leaving him free to participate in overseas tournaments. BCB reduced his ban by three a half months on 26 August 2014 letting him play for Bangladesh from 15 September 2014. First and only cricketer in history to be ranked the No.1 all-rounder by ICC in its Player Rankings in all three formats of the game. Highest individual score by a Bangladeshi batsman in Tests. Fourth bowler in Test cricket history to pick up a 5-wickets haul against all test playing nations following Dale Steyn, Muttiah Muralitharan, and Rangana Herath. One of only three players in history to score a century and take ten wickets in a test match.